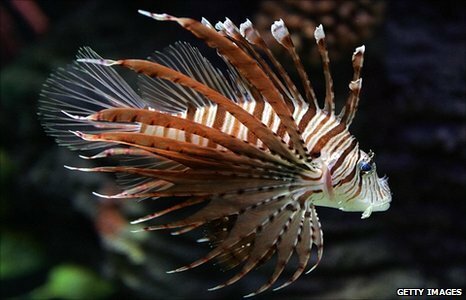 An explosion in the population of the predatory lionfish in Caribbean waters, where it has no natural predators, is posing a widespread threat to marine wildlife. Just off the north shore of Little Cayman, I sink into the blue abyss. I am descending the vertical coral wall at Bloody Bay Marine Park. Straight ahead and straight down there is nothing but blue - a dizzying empty space where sunlight streams down and down into darker places well beyond my reach. 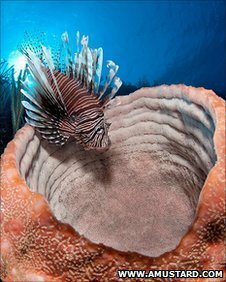 But up close, the wall of coral is covered in giant barrel sponges as tall as a man, bright purple vase sponges, green and red corals and creatures that creep, crawl and swim within and among them. I spot a seahorse, clinging to a whip coral by its tail, a spider crab with legs almost 3ft (1m) wide and a baby hawksbill turtle rocketing to the surface for a breath of air.